Have I ever told the story about how I met a woman names Kayse Pratt? In the fall of 2012, (In)Courage started online community groups through Facebook. I quickly looked for a group and joined Marriage and Mommyhood. Kayse was one of the leaders. And we started emailing each other. She is married to Jonathon Pratt and they live in California. We quickly became friends and have even had to convince people that we are not related- we just met and became friends through these things called Community Groups. We went through 2 sessions together and even became a part of the "Dream Team" together. I have had the honor and joy of reading both her books she released in 2013 and I am looking forward to her book coming out this year. Then last summer she asked me to take over the Marriage and Mommyhood group because she felt the need to step down. I prayed about it and talked about it and I accepted. So this past fall I led the group with my friend Tonya. Now here we are on the verge of registration (hint, hint- TODAY!!!!!) and I am again leading a group with a dear, dear friend- Mel! Mel is another dream sister and she is amazing and I am soooooo excited to be leading this session with her. 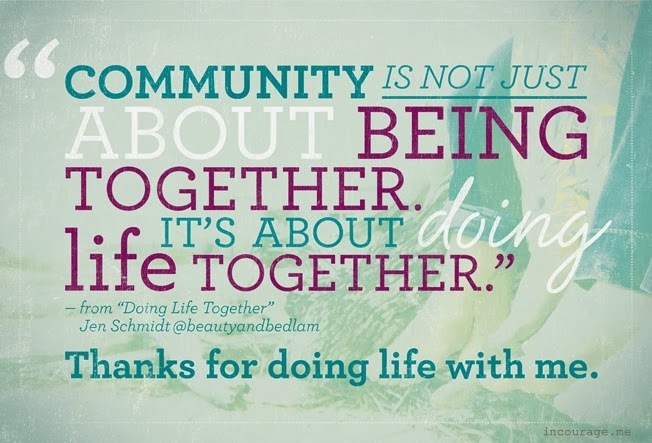 Community groups have brought friends into my life that I would never trade and cannot imagine my life without. The encouragement and support these women give is unmatched in my life. So here's what I want you to do. I want you to head over to the community group sign up page (ladies only- sorry guys) and find a group. There are groups for everything. These leaders are wonderful women with a passion for encouragement. There is no judgement in these groups and they are all based on a shared faith in God. So find a group, join them, and watch your life change and become fuller. REGISTRATION OPENS TODAY!!!!!!!!!!!!!!!!!!!!!!!!!!!!!!!!!! What are you waiting for????? Click HERE today!